When Stanley Yelnats is sent to Camp Green Lake detention centre for a crime he did not commit, life becomes a challenge. First of all, he has to dig a hole a day - as deep as a man - in the baking Texas heat, looking for who knows what. Then, he has to avoid the cruel Mr Sir and... read full description below. When Stanley Yelnats is sent to Camp Green Lake detention centre for a crime he did not commit, life becomes much more of a challenge. First of all, he has to dig a hole a day - as deep as a man - in the baking Texas heat, looking for who knows what. Then, he has to avoid the cruel Mr Sir and the menacing warden. Will Stanley survive in this hostile environment? This is a wonderful, heartwarming, funny and life-affirming novel that is both genuinely original and brilliantly written. Louis Sachar lives in Texas where he writes full time. Recently he has been busy writing the screenplay for the movie of his novel HOLES. 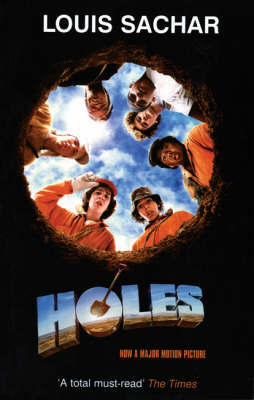 HOLES, the film, stars Sigourney Weaver, Jon Voight and Patricia Arquette and is being billed as a remarkable and hugely entertaining family film - just like the book!